THE political situation in Botswana is stable and no intervention from the Southern African Development Community is needed to avert any crisis. 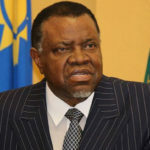 According to an official statement issued by Dr. Alfred Hangari the the President of the Republic of Namibia, Dr. Hage Geingob in his capacity as Chairperson of the Southern African Development Community (SADC) undertook a familiarization visit to the SADC Secretariat in Gaborone at the beginning of February this year. In addition to interactions with the leadership and staff of the SADC Secretariat, President Geingob paid a courtesy visit on the President of the Republic of Botswana, Mokgweetsi Eric Keabetswe Masisi. Respecting relevant procedures on protocol, President Geingob requested to have private meetings with his friends, the former Presidents of the Republic of Botswana, Excellencies Festus Gontebanye Mogae and Lieutenant General Ian Serêtsê Khama outside the formal programme. Due to the unavailability of President Mogae, President Geingob met with President Ian Khama on 2 February 2019. It is correct to state that in addition to other topics under conversation, the two leaders discussed political developments in the Republic of Botswana. However, the objective was not mediation with the view to seeking solutions, but a conversation between friends. The Namibian Presidency emphasized that the meeting with President Khama was neither an official SADC mission, nor a mediation effort where the Offices of the SADC Chair were deployed or mobilized on any matter.